The sky is the limit when it comes to dishes that are ideally served in this Cherry Blossom Noodle Bowl, which is fitting given the ephemeral color scheme on the interior of this bowl. 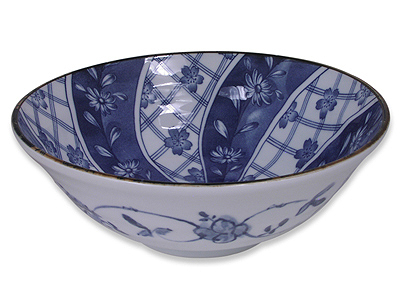 The entire inside of this gorgeous bowl is covered with an eye-catching blue and white design. It is a clever combination of solids, plaids, and pretty cherry blossoms in full bloom. In many ways, this larger Cherry Blossom Noodle Bowl reflects the traditions of Japanese ceramicware. In terms of color, blue and white are classic and beloved, and an exposed ring of cream ceramic on the base is a sign of quality earthenware. Even the cherry blossom design has elements of traditional pieces, but this bowl stands out from other Asian tableware. The smooth glaze easily catches the light and the alternating background of solid blue and plaid done in hues of blue and white is very unique. This Cherry Blossom Noodle Bowl is part of the Blooming Blue and White Cherry Blossom Dinnerware Set. A collection connected by the whimsical, blooming cherry blossoms arranged along the interior of this Asian bowl. Find it in a set for six to set your entire table. As a stand-alone piece, this Japanese ceramicware is ideally used for serving ramen, noodle soup, donburi, udon, and any form of pasta.